To get a glimpse of the real Sweden, you have to go to a stadium in a small town in mid-winter. A thousand spectators stand on antiquated wooden bleachers in the ice cold day. Some in the audience have brought leather briefcases filled with pipe-hot coffee, warmed wine, schnapps and home-made sandwiches. The audience enthusiastically cheer two teams on skates (probably from towns even many Swedes have never heard of), chasing a small orange ball in an oversized version of ice hockey. That is the stereotype of bandy, or ‘ice football’. A reflection of the past, of the working class culture of small town Sweden. It is no coincidence that the club IF Edsbyn won their fifth consecutive national championship in 2007. The game is played on a frozen football field. The objective of the two teams of eleven players is to score as many goals as possible in a game of two halves of 45 minutes. All players, besides the goalkeepers, carry wooden sticks to hit a small rubber ball into a goal of 2.1x3.5 metres. There are rules for penalties, expulsions, corners and offsides. Bandy traces its origins to the game of shinny, an informal game of hockey played on frozen ponds in England in the nineteenth century. In fact, the name ‘ice hockey’ was originally used for what was to become known as bandy. The first know formal game was played in Crystal Palace in London in 1875. Englishmen visiting other countries spread the game, and soon it was played in most of continental Europe. In December 1895, count Clarence von Rosen introduced the game to Sweden. In 1908, English-born crown princess Margareta created the first club of women’s bandy. But the game soon lost out in popularity to football and regular ice hockey. The game needed stable cold weather conditions. 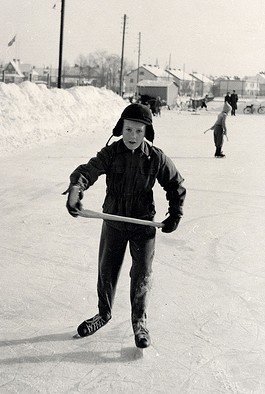 Ice hockey was able to move indoors much more easily because of its smaller playing field. Bandy survived in Sweden, Norway, Russia and Finland. The long winters made a wintertime football season difficult, so players needed a game to keep fit during off-season. Bandy requires very intense physical training and could make use of the football fields. Initially the sport of the upper classes, the thirties fashion started to change. In the Soviet Union, bandy was favourably seen upon as a sport of the workers. In Norway the game was so popular that clandestine national championships were held during the German occupation. When the Federation of International Bandy was formed in Stockholm in 1955, the sport was fading. The first World Cup was held in Finland in 1957, and the Soviet Union utterly dominated international bandy up until the eighties. Political events rekindled the interest in bandy worldwide, such as the break up of the Soviet Union in 1991. It instantly created new competitive national teams and leagues, such as in Kazakhstan. It also became easier to build large indoor winter sports arenas. But global warming may change the map of global bandy. It is becoming increasingly difficult to hold outdoor games in Sweden. In terms of making a transition to being a modern international sport, the professionalisation of the players actually started this century. There is still a lot to do to bring the clubs up to standards of international marketing and media. Bandy sells on nostalgia today. But its future lies in the enthusiasm of players in the new countries such as Hungary, Italy, India, Mongolia and the United States, and what they will bring as their mark on the game.